At the end of volume 3, Teru discovers that Kurosaki - her jerky boss/friend/love interest - is really the kind, sensitive Daisy. What a shock for her! She finally realizes what the reader already knows. But Kurosaki doesn't know that she knows. And Teru doesn't want him to find out. She's worried that their relationship will change or that Kurosaki will disappear altogether. This naturally makes for a lot of awkward situations. Suddenly, Teru is at a loss of what to say to Daisy or to Kurosaki. Will she look suspicious? Will she say the wrong thing to the wrong person? I wouldn't say that the awkwardness makes the book funny. Rather, it makes the volume uncomfortable in a somewhat cute way. Teru and Kurosaki continue to banter back and forth. I love how Teru seems like a vulnerable, weak girl but when Kurosaki makes fun of her or criticizes her, she doesn't wither up like a flower. Instead, she has a retort ready for every jerky comment. Sometimes it's silly things like "go bald," but other times, she does a great and funny job of standing up to him. 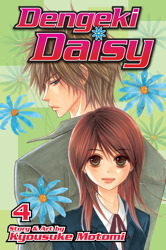 Dengeki Daisy is a contemporary fiction manga, but it's not realistic. I love how the characters in this volume say that this or that could only happen in shojo manga, not "here." And Dengeki Daisy is an excellent reflection of things that can only happen in shojo manga. The emotions are over-exaggerated, the characters stereotypical, and the dangers far too contrived. But it's great mind candy. Motomi continues to do some of the best couples drawings I've seen in manga. I love the emotion that is expressed when Kurosaki touches Teru. Unfortunately, any contact comes mostly from drawings at the beginning of chapters in this volume. There isn't much actual connection. Another interesting thing about this manga is that it is very dialogue heavy - probably more than any other series I've read. It takes longer to read and feels more like an actual book than a comic. Ha, that's why I love it so much - I think Dengeki Daisy is one of the few mangas that doesn't take itself too seriously. I love all the banter and hilarity! Great review :). Motomi is amazing! This is one of my favourites, and I really need to catch up, I'm pretty far behind at the moment. Kurosaki and Teru are so adorable. I love Degenki Daisy because Kurosaki and Teru are so cute together, Kurosaki is so protective of Teru and the hilarious bantering between them!